I was a bit of a slacker this week with pictures! Sorry! Early t-ball game on Saturday morning...called for a hat!! Baseball Tee: J.Crew Factory here. Navy Shorts: J.Crew Factory here. Flip Flops: Old Navy here. I was browsing the mall the other day looking for the perfect retirement gift for Marla (mother-in-law) when I came upon these wedge sandals. In real life, they're a cute gold. 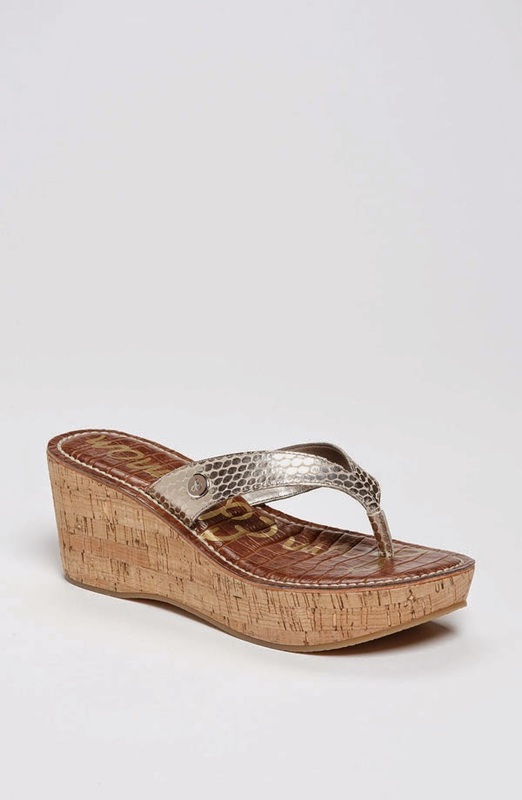 The wedge sandal is cute because it is casual but the wedge makes it a little more dressy. And...they're on sale for under $50!! I knew Marla would LOVE these! 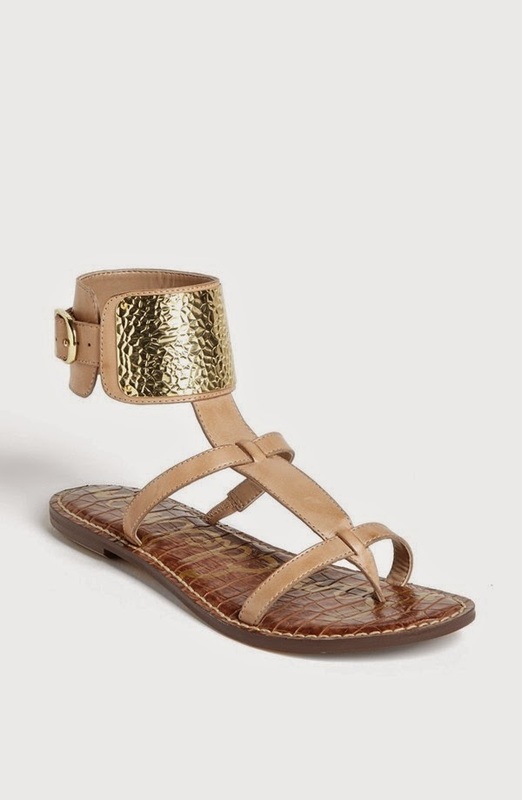 Or these Sam Edelman sandals!! Darling!!! My girlfriend, Jeni, wore them to my house last nihgt for a little girl's night. They are SO cute in person!! And..they're on sale for under $70! Tab...if you're reading this, did you know it would be TOTALLY acceptable for you to get me a gift "just because". If you need a gift idea, try these sandals in a 7. Thank you! Church on Sunday morning...love my side kick saying, "Cheese". Distressed Jeans: Exact Nordstrom jeans here. Jeni's shoes were so cute on her last night! I totally agree! And Bowen saying "cheese" next to you...eeks! That was like the cutest thing EVER! I NEVER would have given those sandals a second look until I saw them on Jeni last night! LOVE. And you're so cute headed to church!!!!! Favorite outfit for sure! Love all three of those outfits, especially the pink ruffle dress!! I am a size 11 but it looks like a few more sizes are available today in the wedge! I need to find $50 haha. Those sandals are super cute! My favorite outfit is the one you wore to church! Such a pretty dress! That pink ruffle dress is adorable. Yeah for no more 8am t-ball this season! LOVE your dress for Sunday church, so pretty and you look fab as usual!!! You look adorable and so put together for the baseball game!!! And, those Sam Edelman shoes!! Love! LOVE that pink ruffle dress :) SO CUTE!!! I actually AM a size 11 - but I'm also 6 feet tall...not sure if I can pull off those wedges?! Those Sam Edelman sandals are awesome, though!